For the past few months I've barely been out. Its been papers and work, work and papers. Weekends have generally been spent going to and from Nottingham - with hardly a bird in sight - and I haven't been checking the alerts or meeting up with any birders. If it weren't for the great mix of breeding waterfowl on the lakes at the University I think I'd have gone doolally. Life after the PhD seems to be a stress of temporary contracts, CV building, and job applications. Thankfully for my sanity, I did manage to get one exciting thing done in the past four months. A two week research cruise on the Prince Madog. Below are some of the extracts from my ship board diary. Enjoy. As I left the train at Milford Haven I could see an Italian man asking directions from the other passengers, a fishing rod strapped to the side of his pack. We group up, and begin to wander in the direction of the harbour, making our introductions as we go. His name is Federico; a mathematician, who had been advised to volunteer for the cruise by a friend. Further up the station platform our conversation took the attention of another girl, who promptly announced that she would be joining us as well. Her name was Niki, a little shorter than me, with auburn hair cut into a neat bob. She, like Federico, was fabulously friendly. Together we crossed the bridge toward the waiting Prince Madog, sitting quiet at her berth in the calm water of the harbour. As we approached, others were disembarking, packing a car with samples and people to return to Bangor. 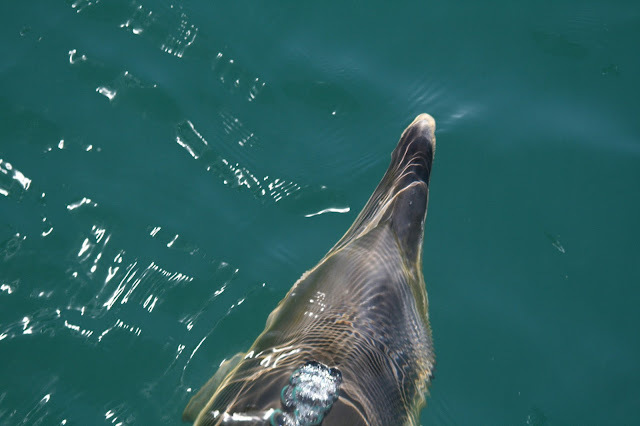 We had barely a moment for a wave and a greeting before they were whisked away and we were welcomed on board. Quick behinds us were Sarah and Lucy who were also joining the ship, and Leigh, James, and Marin, already aboard from the previous fortnight’s surveying. We are shown to our cabins, and I swiftly unpack, happy to rid myself of rucksack and camera bag. Then the unwelcome news is delivered. We would not be sailing that evening. Outside our calm harbour the wind was rising, creating un-workable swells. Last fortnight they had lost a member of the research staff, taken back to shore in a state of extreme sea sickness. I did not want to repeat her uncomfortable experience. One by one, we gathered in the dry lab; bringing the collection of laptops, hard drives, headphones, coffees and snacks that follows the researcher abroad. Together we worked for the next six hours, each on their own projects, or on papers in varied stages of completion. Enjoying the welcome catch up time provided by our floating “hot-desks”, I forced myself to catch up on the required reading for an upcoming review, before pulling together the methods and results from a thesis chapter (the last to be prepared for publication). Eventually the day wore away and, simultaneously disheartened by the delayed departure and full of the joys of being in a new place with new people, we wound our way to the pub. Here James and I chatted about the cetacean surveys planned for the next fortnight, mulling over some of the potential sightings. I make a passable show of playing pool, before one pint too many takes the edge off my aim. From there it is a short amble back to the boat and our berths. 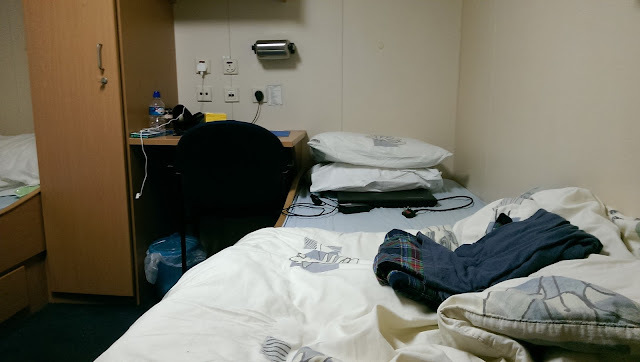 I slept well in my narrow bunk, waking at seven to the noises of the crew beginning their day. At 7:30 I rose myself, dressed and went in search of tea in the galley. Here I heard the first mention from Jerry and Rob that we might not be sailing that evening either. The wind had swung to the south east, leaving us with nowhere to anchor comfortably overnight. Even in the harbour the water had gained some chop. The Madog, which had sat as still as a rock at its moorings, now gave the occasional sway, as if trying to prepare us mentally for the next fortnight. I take a stroll around to the marina, bitten by the brisk wind. I have taken my camera to get some external shots of the boat, but the wind buffets me and my footage is wobbly. Soon my hands are bitten by the cold and I give in, flipping the DSLR back to the camera setting. Some of the boats in the harbour are very charming. I am particularly taken by Three Sheets to the Wind, a trimaran painted in British racing green. She is in need of a little love, her decks stained green with the grown of algae; the paint on her matching tender beginning to peel. I take a snap of her name and her triplet bows to remember her by and amble back toward the Prince Madog. After a truly mammoth brunch of sausage, egg, bacon, black pudding, mushrooms, beans and chips, we had our safety tour. I had remembered just enough from my sea survival not to look a complete moron (even though my memory of fire extinguisher labels was lacking a little). With nothing to do until dinner that evening, we again fell to our laptops and work to cure our boredom. If we continued in this way for much longer I would at least have something new to submit on my return to York. The alarm went off at 6 30 and I forced myself to get up. Tomorrow I would be on deck working from six, and I intended to ease myself in to it. I slunk upstairs to get myself the first coffee of the day and watch the weather forecast. The forecast was promising, a mix of local lows and swirling air currents making for calm conditions. It even looked sunny. Spirits were high all round and I enjoyed a fantastic fry-up curtesy of Colin, the chef on board. Ten past eight rolled around and we left on the high tide, steaming our way south west past the numerous bumper boats. There was little in the way of bird life around as we began our journey. 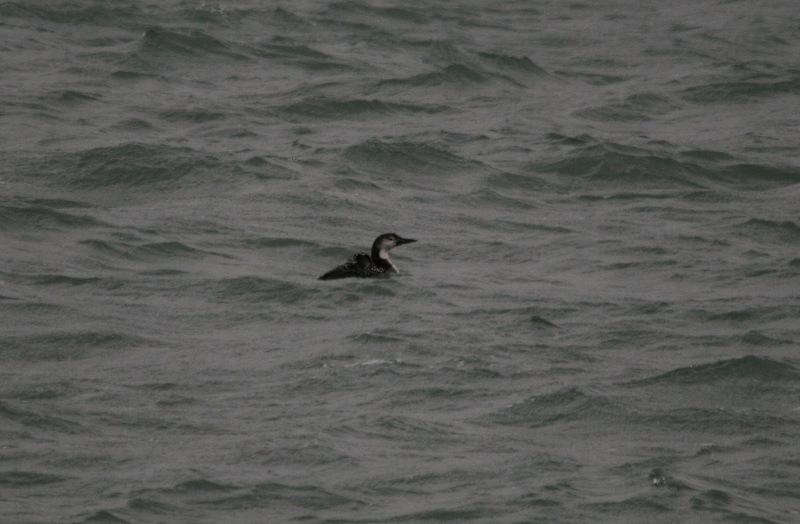 The only highlight being a great northern diver as we passed Dale, then we were truly out into the Celtic sea. I decided to join James for a couple of hours on cetacean watch, the others coming and going as they got used to their sea sickness. The marine mammals were not forthcoming, but the birdlife was good. At one point James called what he initially thought was a blackbird overhead, but as it turned we saw a flash of cream on its breast; it was a male ring ouzel, migrating back to the UK after a winter on the continent! After a quick lunch for those that could eat (lamb broth), we got started. Water samples, grabs, dredges, and trawls. Catch sorting and weighing. Separating plaice and spider crabs for gut content analysis – dissecting said plaice and spider crabs and preserving them in formalin. We finished at nine thirty in the evening. Federico and James jigged and fished from the back of the boat, Federico landing three dogfish. And suddenly, dolphins; chasing fish in the light off the stern. I dashed inside for my camera and managed a few quick shots of the figures ghosting in and out of the pool of light surrounding the boat. And beyond them, the eerie figures of loafing fulmars on the waters surface. After a night’s steaming to the new sight, six am rolled around far too quickly. Still, I forced myself to get up and went in search of a cuppa. During the night the birds had surrounded us, and formed a ring of gannets, greater black backs, fulmars and kittiewakes. They loafed on the water’s surface as we took our first samples, eyeing the boat for any sign of a free meal. This morning I was filtering water samples, but I could tell things were wrong outside… there were no pots full of processed animals appearing. In fact, their first sample was being boxed up as Sarah and I had finished three niskin bottles worth of water. We were on decidedly cobbly ground and the large stones were fouling the grab. As we waiting, a new bird arrived, exhaustedly fluttering to the crane above us. Today’s stow away was a chiffchaff, who explored the decks (and even the galley) in search of food. I eyed it from my station, itching to grab my camera; but we were trawling now, and we needed all hands. We hit a snag on our second tow. Whilst bringing the net aboard the quick release slid loose, just a moment before the cod end swung safely over the stern, and the catch disappeared into the turquoise waters. Another half an hour lost after the palaver of the rock fouled grabs earlier in the day. Thankfully tempers were kept, and we swung the boats and prepared to run back along our course. Those of us not watching the net took the opportunity to rest up. Sarah, Nicky and I stretching our muscles with a few reps of squats, press ups and planks. Then we clock watched, counting the minutes until we could land this catch and steam to the next spot. After an age the winches fired into life and the net rose to the surface. Phil and George span the second winch to draw in the cod end, but there was no bulge there to suggest the time it had been down. We’d damaged the net. Somewhere along the 30 minute run it had either snagged or we’d taken in a large boulder, and it had ripped the gut out of her. Anything in or subsequently entering the net had gleefully skipped out through the hole that remained. Grimly, the net was dragged aboard and Phil and George set about repairing it as we steamed for the next site. The sun shone regardless and the white paint of the Madog glowed so bright that she hurt the eyes. That evening we worked together in the dry lab. Only noticing that we had arrived off the coast of North Devon when our phones chirped into life. I worked on the methods for a paper while the others talks and worked around me. Then, as the sun dropped away, we found ourselves at the stern, peering out toward the sunset in hope of the elusive “green flash”. The lightshow never arrived, but we did see a beautiful calm sunset, framed by the merest whisp of cloud. The second early morning was not sitting well with me, and I blearily drank my tea as the others appeared. However, by the time our 6:30 shift started I was happily pulling on my oilskins and boots. Sarah and I worked the niskin and filters again and we had the three samples squared away in no time. I gave the area a swift clean down and set up the labels for the next site before heading out to assist on deck. 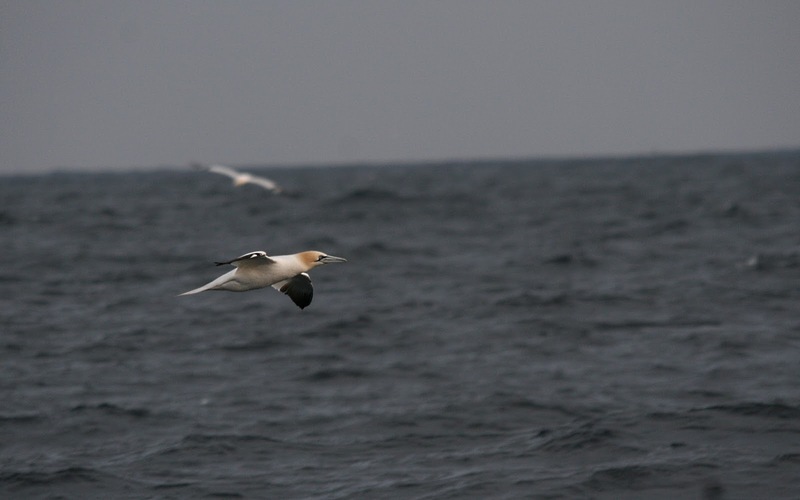 When we broke for breakfast at seven thirty I was done with fry-ups, opting instead for Shreddies and a banana, hastily drinking another coffee before we were due back on deck.During the final grab samples I noticed that an arctic tern had joined the parade of seabirds following the ship. After the trawls Federico, Nicky and I threw the dead catch to the waiting gannets, watching them plunge into the water after the easy meals. In the afternoon the trawl brought more plaice for my samples, and very little else. We sorted the grabs and dredges quickly and had interesting (though meagre) catches in the trawls. Wrapping up at four I grabbed a cup of tea before meeting James on the foredeck for a shift as cetacean survey scribe. After half an hour of noting down sea bird abundance James noticed a pair of common dolphin approaching from port. Then nothing for another five minutes, then six dolphin came straight as us from the port side, moving to take station on the bow. They were swiftly joined by the earlier pair and skirted periously close to the ship. Abandoning James for a few minutes with my camera I snapped happily down into the water, watching as they rolled in the water to peer back up at me. I returned to take my place as scribe and after 6 more minutes was relieved by Niki, but the dolphins had gone.Below decks Colin had cooked steak and mushroom pie and I was happy to get some hot food inside me. After wolfing both it and a helping of rhubarb crumble down, Lucy and I headed back to the wet lab to dissect the day’s plaice catch. Parcelling and preserving the stomachs of 14 fish for analysis. Job done, I headed down to my bunk at eight. We awoke to find that the winch had gone down overnight, and we wouldn’t be trawling without it. We took the time to carry our addition cetacean surveys while the engineers worked away. As we steamed between sites I took the time to dissect my catch, bagging the stomachs for preservation in formalin. I could see smaller fish in the gut contents of my plaice and excitement abounded. If there are microplastics in the guts of these smaller fish I could be looking at trophic transfer; I could find out something new. In the morning we quickly finished of a site, knowing that w had an important stop to make later in the day. We were changing crews, and had to be in the harbour before the tide made entry impossible. I would be sad to see them go. We arrived back at Milford Haven at 1500, in glorious sunshine, and we rushed off for a taste of life land-side. I felt decidedly land-sick in Tesco, in a way that I hadn’t been on the boat. The lack of motion was bizarre, but I was determined to stock up on fruit for the remainder of the trip. Then, laden down with smoothies, grapes, plums and raspberries, I went in search of a fortifying pint and a game of pool in the Heart of Oak. I forced myself to rise at 0630, knowing that my reward would be a full day in Milford Haven. After grabbing breakfast with Niki, Lucy and Rob, I signed myself ashore and headed off for a walk along the coast, a full two hours to myself. The others were heading to Skomer Island, but I saw the opportunity to get ahead on some of Andreas’s statistics (I am a firm believer that a holiday is only good if you can extend its affects after you get back to work. Either that or I have not fully rid myself of PhD writer’s guilt). The walk was a welcome change, if a little urban in places. There were linnets, blackcaps, swallows, and my first house martins of the year. I skirted the harbour eastward, following an old railway line which on which was now the coastal path, then in at a little harbour. Here the path swung in to meet the road and I decided to double back on myself, unready for cars and civilisation. I checked my emails for any emails regarding my interview the previous week… nothing; but I did have another offer of an interview elsewhere. The day I travelled back from Bangor. I swiftly called to communicate the issue, settling on a 5pm interview slot. It would be tight, but I was keen to impress my eagerness. That evening the rest of the team went ashore to the Heart of Oak. I saw my chance for more time alone and retreated to my bunk with a book. 19/04/2016Today marked a break in our routine. At 0500 we moved round to Dale to pick up the techs from Bangor who were to be calibrating the sonar. I sat and watched the sun rise with a coffee, snapping the occasional shot of a flock of brent geese, inching there way round into the bay at dale. Without much else to do, I worked, ticking off more work for Andreas and ringing Moors for the Future to confirm some details for the surveys. By one the calibration was done, and once again we headed out from Milford, hoping to get the last grabs and anchor dredges we hadn’t managed two days earlier. In the flat calm we arrived on site with time to spare and quickly deployed the dredge. As we swapped the gear dolphins appeared to starboard, bow riding with us for 10 minutes. Then the 2 meter beam trawl came in, and with it some of the biggest brittle star catches we’d had all trip. There must have been a few thousand individuals in each trawl, but these were our last samples, and we sorted them with good grace. By five thirty we had washed down the wet lab, and I headed up for a few hours on a cetacean transect with James. Steaming out to Lundy to begin our line west we were struck by the full force of the steadily lowering sun, its glare catching the sea between 0 and 20 degrees. Spotting anything ahead was a nightmare. The two hours past with little more exciting than a flock of twenty golden plover flew through, obviously on their migration north to breed. That evening we watched All Is Lost, an almost dialogue-less movie in which Robert Redford plays “our man”. Solo sailing his vessel strikes a container, damaging his radio and positioning equipment. We followed the tail of mishap and bad luck to then end, which received a mixed reception from the science team. Throughout the film, Rob interjected with interesting facts about survival at sea, putting us all in a thoroughly positive mood before bed. 20/04/2016James and I sat on watch from 0730 until 0830. There were plenty of puffins moving through and a steady trickle of migrating swallows. The light was better than the previous evening and, with ten minutes to spare, we spotted the first common dolphin of the day. As we wrapped up I went to the bow to get a couple of shots of birds as they flew past, then we swung to head back to land, coming head to wind. The ship hit the first oncoming wave with a bang. It was going to be a lumpy run. Knowing there wasn’t much to be done in this swell, I slunk back to my cabin to sleep. For me, the trip ended with a steam up the coast of Wales, and a slightly damp rib to shore in Holyhead. Federico, Sarah and I got the train together to Bangor, and I was grateful that the swaying carriage put off a great deal of my land sickness. It was a long run home, followed by a skype interview which bought me back down to earth with a bump. Since returning to land I have continued to rise early, getting to work for half seven; and have bumped into Colin and Phil in a bar in Beaumaris. But everything has seemed a little drab. Thankfully I still have some video footage to edit together, and a lot of pictures to wade through. Best of all, I have a host of new friends up and down the UK; and with lots of catch ups planned, I'm sure I won't be bored for long.